A combination of high input management systems, high annual rainfall and deep, permeable soils in northern Tasmania create conditions that are conducive to high drainage and nitrogen losses below the root zone. An understanding of the extent and mechanism of such losses will enable farm managers and their consultants to identify and implement more sustainable management practices that minimise potential adverse financial and environmental consequences. Analysing the fate of water and nutrients in farming systems is complex and influenced by a wide range of factors including management, soil haracteristics, seasonal climate variability and management history of the paddock/farm in question. 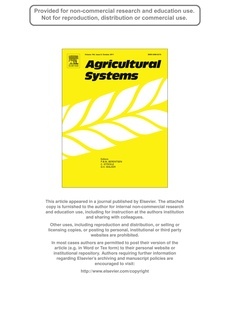 This paper describes a novel farm system modelling approach based on the model APSIM, for analysing the fate of nitrogen and water in mixed vegetable-based farming enterprises. The study was based on seven case farms across the Panatana catchment in northern Tasmania. Substantial simulated drainage losses (>100 mm average seasonal loss) were apparent for all crop and rotation elements across all farms in response to the surplus between crop water supply and crop water use. Crop nitrogen demand was found to be close to crop nitrogen supply for all crop and pasture rotation elements with the exception of potato, which had an average surplus nitrogen supply of 89 kg N/ha. This resulted in potato having much higher nitrate nitrogen leaching losses (32 kg N/ha) compared to other crops (<10 kg N/ha). Simulations suggest that practicable management options such as deficit-based irrigation and reduced N fertiliser rates will maintain current levels of productivity while reducing potential offsite N loss and generating significant financial savings via reduced input costs.